The requirements have changed. Whoever is playing chamber music today can't be limited to the rules from decades ago. The expectations regarding the diversity of repertoire have changed, which creates room for ensembles like the Faure Quartett, which has established itself as one of the world's leading piano quartets within just a few years. Dirk Mommertz (piano), Erika Geldsetzer (violin), Sascha Froembling (viola) and Konstantin Heidrich (cello) use the opportunities arising from these developments. They discover new sound fields in chamber music and perform compositions outside the mainstream repertoire. They are visionary in their approach and highly regarded for their experiments and discoveries; be it performances with the NDR Big Band, collaborations with artists like Rufus Wainwright or Sven Helbig, appearances in clubs like the Berghain, Cocoon Club or "Le Poisson Rouge" in New York or TV shows in KIKA or "Rhapsody in School", getting children excited in chamber music. When they released their album "Popsongs" in 2009, there was a great deal of buzz in the press and audience. In the following year, the ensemble was awarded the ECHO Classic for their album "classic beyond borders", their second award after their recording of Brahms' piano quartets (Chamber Music recording of the year, 2008). Other prizes include the German Music Competition, the ensemble prize from Festspiele Mecklenburg-Vorpommern, international competition and recording awards, Music Prize Duisburg and Brahms prize Schleswig Holstein. The musicians of the Faure Quartett are pioneers in many ways. After they met during their studies in 1995 in Karlsruhe for the 150th anniversary of Gabriel Faure, they quickly realized, that this combination offered new insights into undiscovered repertoire. In 2006, they signed a contract with Deutsche Grammophon, promoting them to the Champions League of the classic music business. They made highly regarded benchmark-recordings with works by Mozart, Brahms, Mendelssohn and pop songs from Peter Gabriel and Steely Dan. Sony Classical has just released works from Mahler and Richard Strauss. Worldwide tours raise their profile abroad and international masterclasses are part of their work with students. The members teach at the universities of Berlin and Munich. Moreover, they were Artistic Directors of "Festspielfruehling Ruegen" and are 'Quartet in Residence' at the University of Music Karlsruhe. During their tours, the musicians appear in the world's most important chamber music venues; including Concertgebouw Amsterdam, Alte Oper Frankfurt, Berlin Philharmony, Teatro Colon Buenos Aires and Wigmore Hall London. All these mosaics form a unique profile for this defining chamber music ensemble. 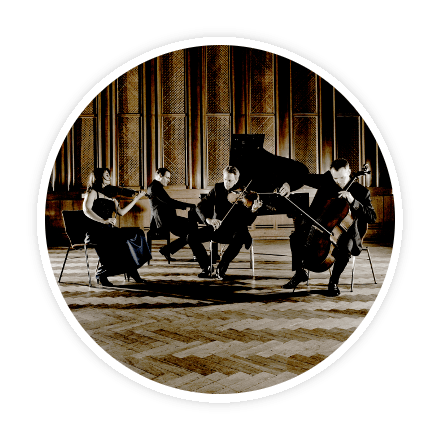 "The Faure Quartet members proved just as successful in Brahms' Piano Quartet No. 1 in G minor, a much better-known quantity. Again, the musicians brought both strength and refined lyricism to the work, as with the vivacious lilt to the Intermezzo and a charming insouciance to the movement's coda." "The whole performance had a prismatic vigor." "This was a performance of great finesse and sensitivity." "The communication between the four performers was as beautiful to watch as their music was satisfying to hear. This quartet thinks and breathes as one, focused on a singular, clear vision for their music making." "By any standards the individual members of the Faure Quartett play extremely well. What is especially impressive, however, is how well they play together and how well balanced is the total ensemble."